After YouTube and Google, Pinterest is going to launch its Buy Button for the pinned products. 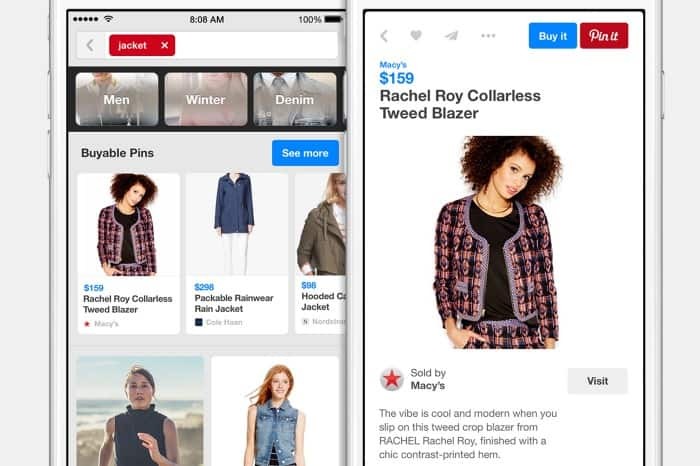 Pinterest will unveil a new option for retailers to sell their products. “Buyable Pins” is the new feature which will allow the users to shop on the site by clicking on “pinned” products to see the price, choose a color, size, and quantity. Visitors can then click on a buy button to complete the transaction using a credit card or by paying with Apple Pay through their iPhones. The buyable Pin will be with blue colored price tag. Currently this option will be available only for the iPhone and iPad users in US at the end of this month. Buyers will be able to discover more than 2 million Buyable Pins on their iPhone or iPad.Buying option for android and desktop users will be available in the future releases. CEO and co-founder Ben Silberman said “Consumers have now added 50 billion pins since the company’s launch and that the number added is growing 75% annually. People want to buy things on Pinterest”. This is a new way to reach to the buyers and hence increase the sales. Pinterest has initially merged with retailers like Macy’s, Neiman Marcusand Nordstrom to help pinners buy the pinned products. Thousands of businesses will also get Buyable Pins through online commerce platform Shopify, including Madesmith and Poler Outdoor Stuff. Earlier Pinterest had launched its motion based promoted pins to boost the ads with “Cimentic Pins” and now with the launch of this buy button, Pinterest is competing with Facebook and Twitter to create a bigger commerce business.